I spent 25 days last year riding in China and I loved every minute of it. I was treated well by the people, Ughyurs and Hans alike, even though the machine guns at the numerous sentries along the way served as a constant reminder to the visitor that all was (and still is) not well. Because of that, the last thing I'd want to do is to make fun of China. 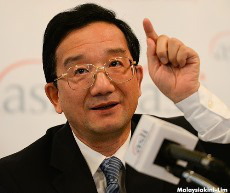 But the Chinese envoy to Malaysia really ought to be more diplomatic and less Guanengish and not be so judgemental of others, least of all his own kind and patient hosts, when making statements about race relations in Malaysia. We are well aware of China's own track record when it comes to its own minorities and the use of violence, so let us not go there. Envoy in the news: Good intentions, wrong headlines! Dr Huang Huikong can rest assured though that our police and authorities sans machine guns are more than capable of handling a few thousand red or yellow shirts who threatened to disrupt racial harmony in Malaysia, be it at Masjid India or Petaling Street. Over a million tourists from China visit Malaysia annually because we are beautiful, peaceful and cheap. Our Tourism Minister is even prepared to make a fool of himself as long as more Chinese come to our country, especially now that the Ringgit is so weak. ,You see, we don't even blame China for our currency's predicament when other countries in the same boat are claiming (not without justification) that it's Beijing's doing. So please, Dr Huang, give us more credit lah. Promote Petaling Street and peace but no need to make any more claim about China's sterling race relations and all that crap or how Beining would not sit idly in the face of discrimination blah blah blah because all that's not helping. p.s. The picture above is just a gambar hiasan, a file pic. The blogger Big Dog had posted it on his FB and asked friends to add a caption to it, just for fun. Neither YB Hishammuddin Hussein, our Defence Minister, nor Big Dog reacted that way to Huang's claim. As a matter of fact, Big Dog seems more irritated by Nazri Aziz, the Tourism Minister in Anifah: Nazri is out of line! Huang has also brought out the best of Helen Ang's sarcasm in Ambassador settles the question: We ARE Chinese -- Hooray! "Over a million tourists from China visit Malaysia annually because we are beautiful, peaceful and cheap." Also paid for and bussed-in, too. PDRM gave them a free shower. But two PDRM personnel got taken to hospital. Time for realpolitik! Better get used to predators from the north, east, south and west coasts. They may even decide to divvy up the spoils. Malay elites are not stupid, so that is why so many are shopping around for properties, bank accounts, etc abroad. On the other hand, PRCs are also doing the same for the same reasons - to put their assets (however acquired)beyond the Commies in China. Anything related to chinese...they are really good at...baling batu sembunyi tangan! At least the Chinese Envoy was escorted by a somewhat moderate-Buddhist-MCA guy. That itself should be telling. I don't think Beijing would cherish the thought of 'making-friends' or lending-a-hand' to an Evangelist infested DAP which resembles those of their rebellious brethren in Hong Kong and Taiwan R.O.C. So rocky, first of all, if someone ask me where that 2.6b came from, should I answer, orang arab derma? "We don't want foreign interference". But if you want to illegally fund Umno's election campaign to the tune of 2.6 billion, feel free. China was an international pariah before Malaysia recognised Chinese Communist Party. So China should be wary of losing the friendliest malay nation it has. Malays may be friendly and unbiased but that doesnt mean they are stupid. They have fought the Communist China Chin Peng before so they are not afraid of China. But rather China should be afraid of the Malays. Everyone in ASEAN is up in arms over China expansionism in the East Sea and Phillipine Sea. Name one country that is not antagonistic towards China? Kedua-dua sahabat saya dari Johor ini adalah pelawak yang terhormat! Sudah tentu semua Menteri-Menteri dan sahabat-sahabat mereka berdua mencuitkan hati dan jiwa. Namun demikian, Tok Hisham janganlah nak komen fasal Duta Besar China HE Huang yang dibawah tanggungjawab YB Menteri Luar Anifah Aman..kan sudah tegur kelmarin! Dear Jean...kalau duit u tak laku...feel free to donate it to me!...btw u guna duit apa? Yang saya tau duit kita yg tak laku duit cap pisang!..masa penjajahan tentera jepun...anyway it was really a good joke by you...now do you still want to donate your duit tak laku into my bank account! U must be dreaming abt 2.6b every night...what a bore..
Thailand? Myanmar? Pakistan? Singapore? The Pacific island states? The UK? Malaysia is not the only show in town, as far as China is concerned. The MCA chinese are really dumb. The fact is that there was a DAP Chinese who provoked the Chinese Ambassador with a leading question. 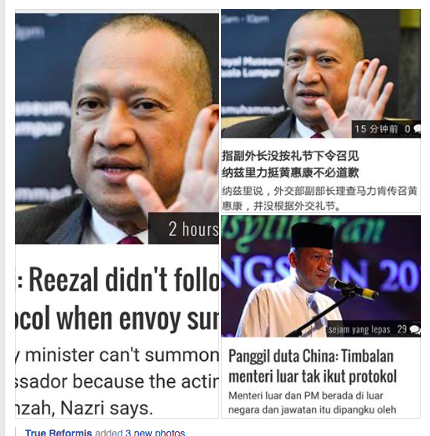 And as loyal subjects of the Yang DiPertuan Agong, the MCA should apologise for the interference that China threatened the Malay Federation instead of trying to confirm that yes indeed the Chinese in Malaysia who were granted citizenships are fifth column of the Chinese Communist Party. When Chinese coolies migrants were given the Malay Federation citizenships they swear allegiance to the Yang DiPertuan Agong. Any Chinese who swear allegiance to the Chinese emperor or the Chinese Communist Party are automatically Chinese citizens. This definition is clear when the British brought the Chinese coolies to work in tin mines. 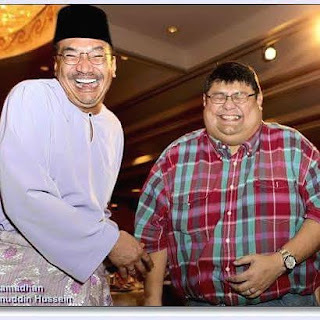 Instead of attacking fellow BN member Tajuddin who promised to lempang Chinese who are disloyal and threatened to attack the malay states, MCA as part of BN should be on the Yang DiPertuan Agong. By not supporting to lempang ingrates and indeed treasoners Chinese, MCA leaders seems to think its okay for China to attack the Federation. When the DAP Chinese invited the Chinese Communist Party to attack the Malay Federation that is treason and the Government must find out who this chinese traitor is. He is as dangerous as IS terrorist.